With a week to go before the lifts start rolling for the 2017/18 season, the storm that’s heading our way could not be timed any better. We’ve had a few snow flurries already in early November that gave us the beginning of a base above 2000mts but the low pressure that’s currently pushing it’s way into the southern alps promises great things. We expect the snow to start falling Friday afternoon, but the real heavy snow is forecast for Saturday with anything upward of 50cm predicted. The weather system hitting us is similar to the ones that brought us really good early snow last season. Basically a low pressure builds in the bay of Genoa (Genova) when cold air enters the region and mixes with the milder humid air of the mediterranean. 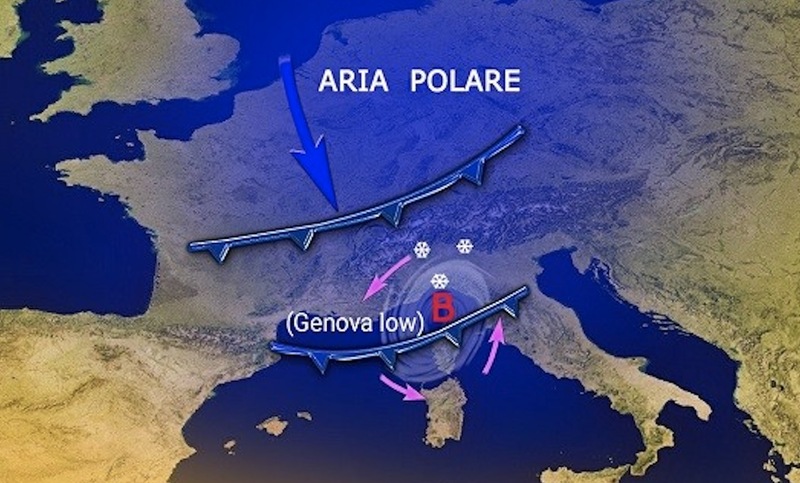 As low pressures have an anti clockwise rotation the depression then swings back in from the east toward Piedmont region dumping snow on the south western alps. The French call this a retour d’east, we simply know it as a Genova low. This is great news for Sauze d’Oulx and the Vialattea in general. There’s always a buzz of excitement when we learn that a Genova low is brewing. Time will tell how much snow this one brings. Temperatures have been cold all week allowing the cannons to operate. They’ve produced great amounts of snow all the way down to the village so with the natural snow that’s forecast along with the man made stuff, the opening weekend should see great skiing. Once this weather system has passed on Saturday evening we should see a return to more settled weather with the temperatures increasing in to the positive. We do currently have another smaller system reaching us possibly on Friday 8th December but as that’s a week away we’ll just have to wait to see what happens.